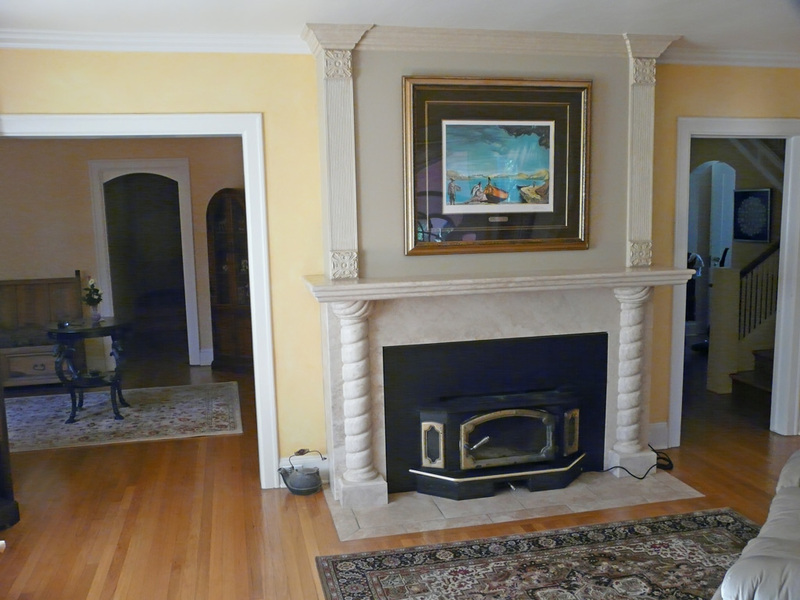 Odd shaped room was defined by the presence of a large masonry column in the middle of the room, behind the refrigerator, that supports a second floor natural masonry fireplace. 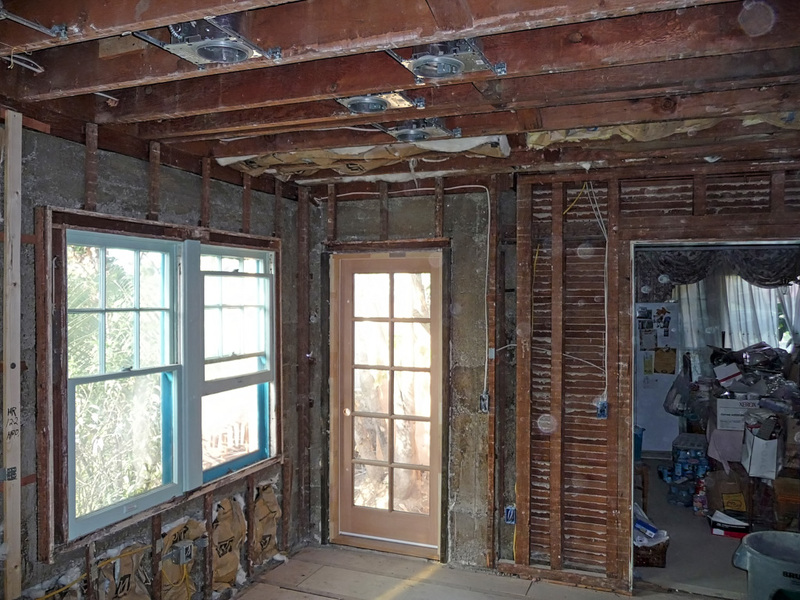 All the exterior walls in this home are made from reinforced concrete not wood framing, which adds to the difficulty factor of making some alterations. 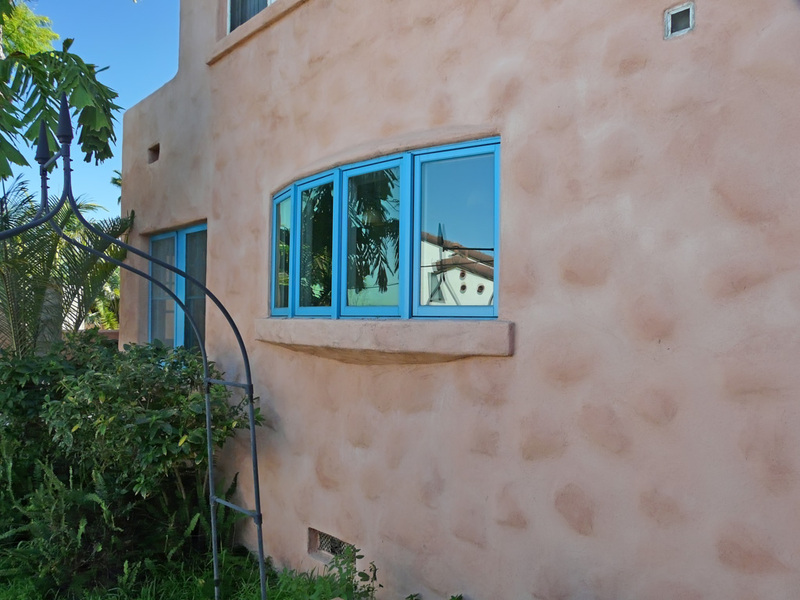 Replaced the old metal garden window over the sink with a new wooden bow window system that offers far more ventilation and whose casement windows is more in keeping with the architectural style of the original wood window throughout this home. 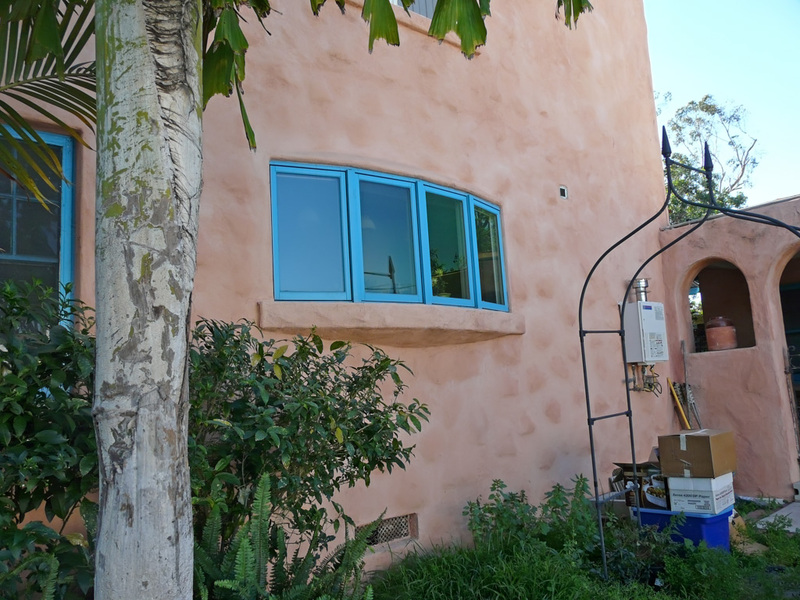 Added a new door to the front of the house in the place of an existing window. Created a small breakfast table connected to back of cook top peninsula. 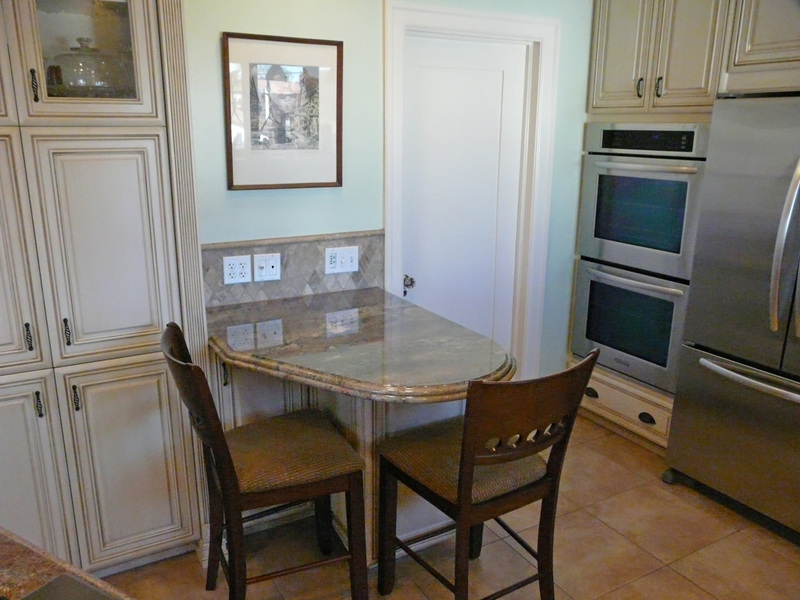 Created a combination phone center, baking center, eating and work prep area with bar stools. 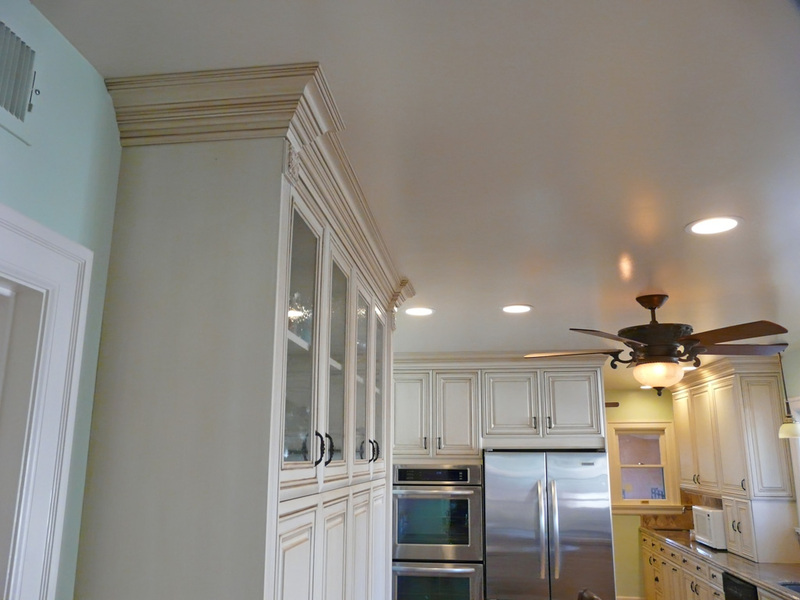 LED recessed cans in the ceiling offer wonderfully bright lighting at only 12 watts per fixture rather than the normal 75 watts for halogen equivalents. 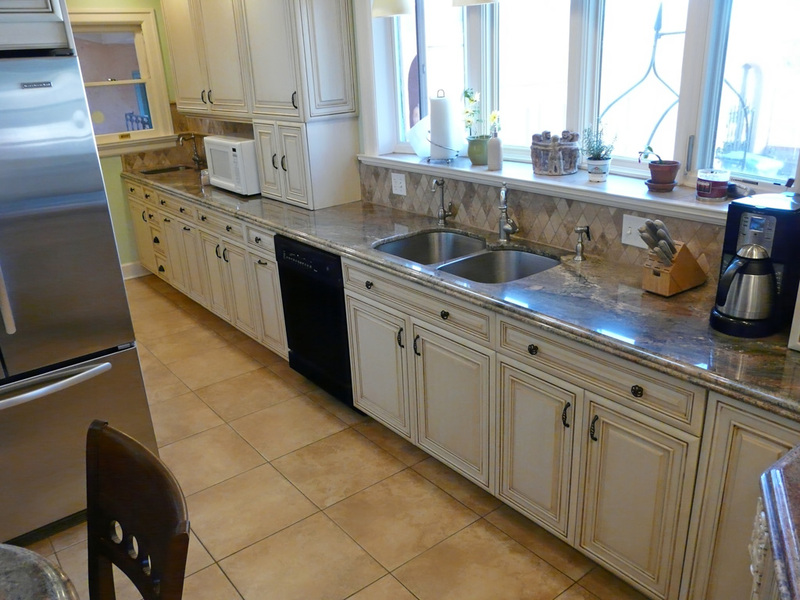 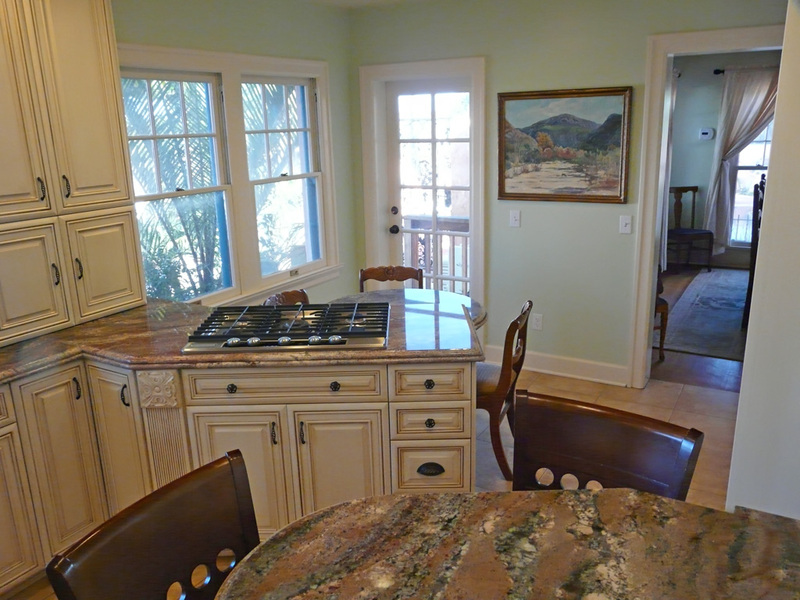 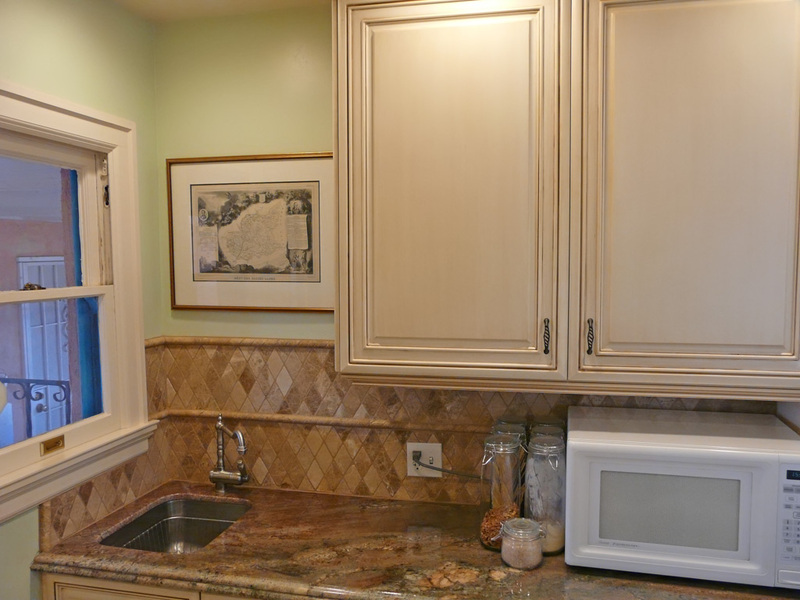 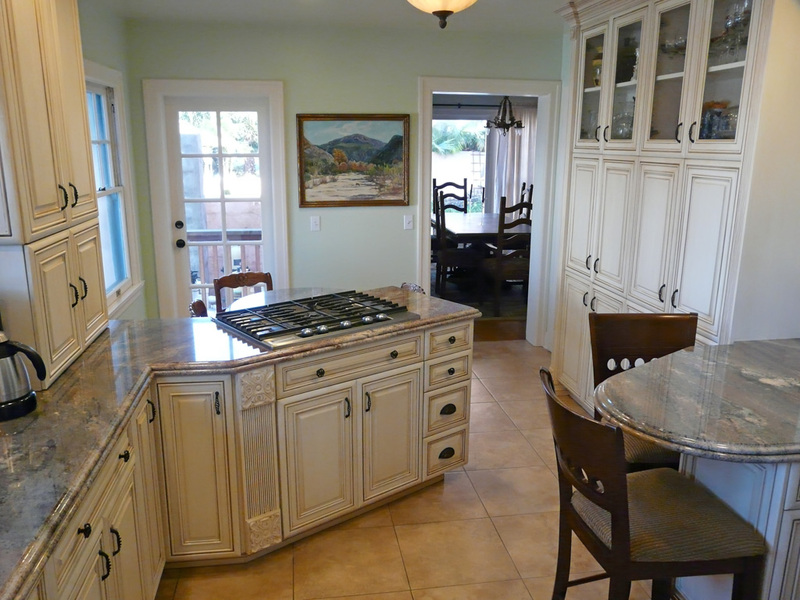 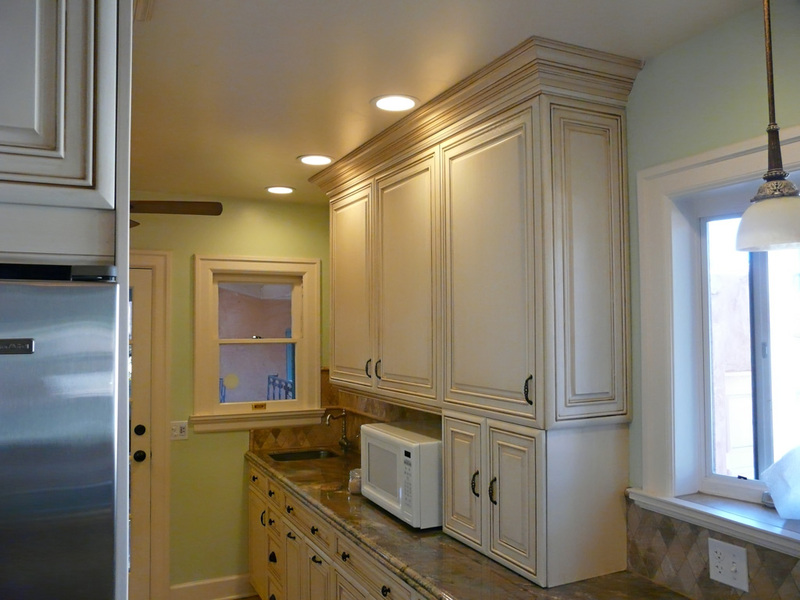 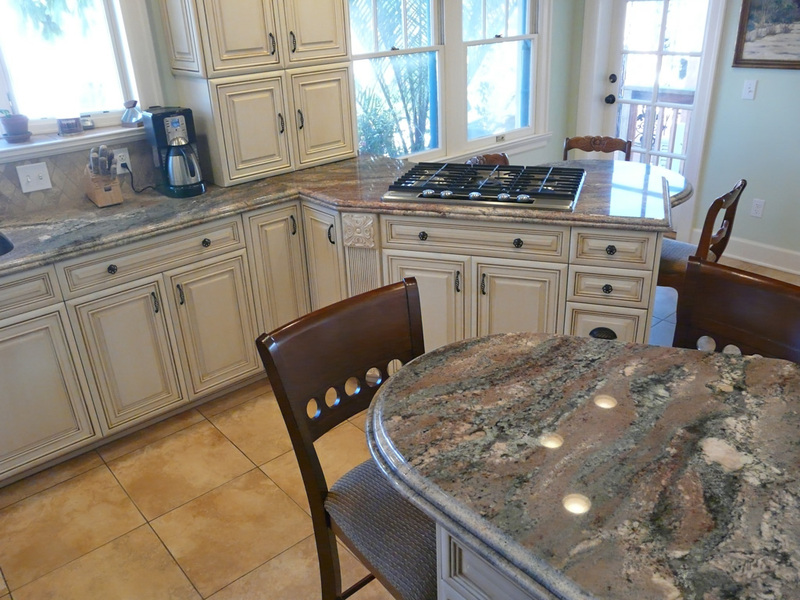 This unusually shaped kitchen had numerous obstacles that you can see in the before and construction photos that defined the shape of the room we were forced to deal with. 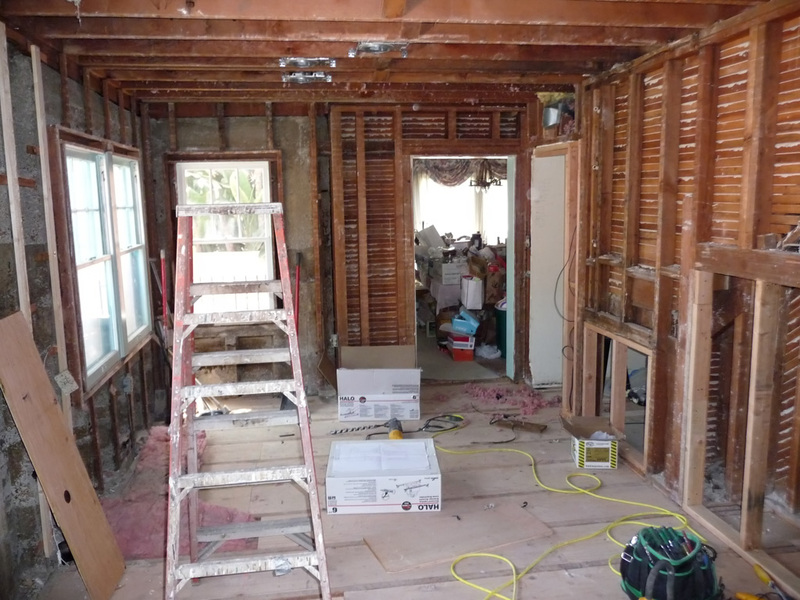 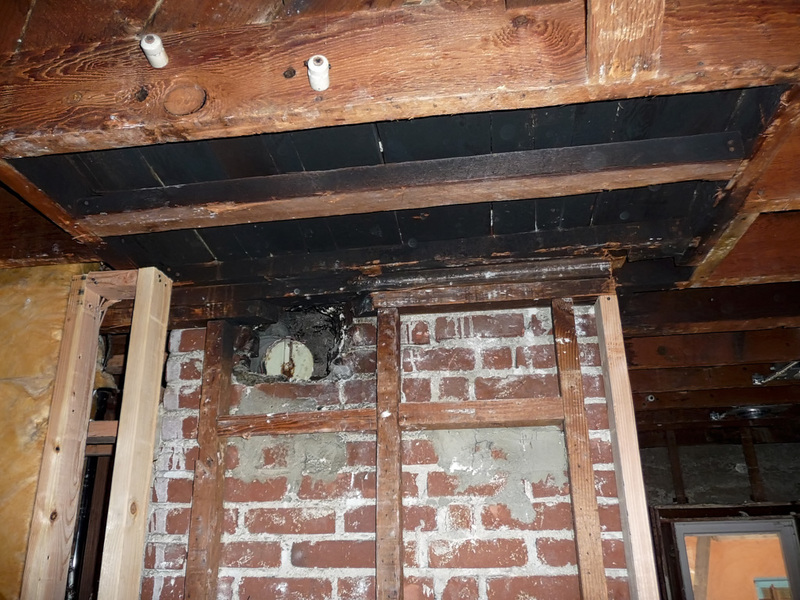 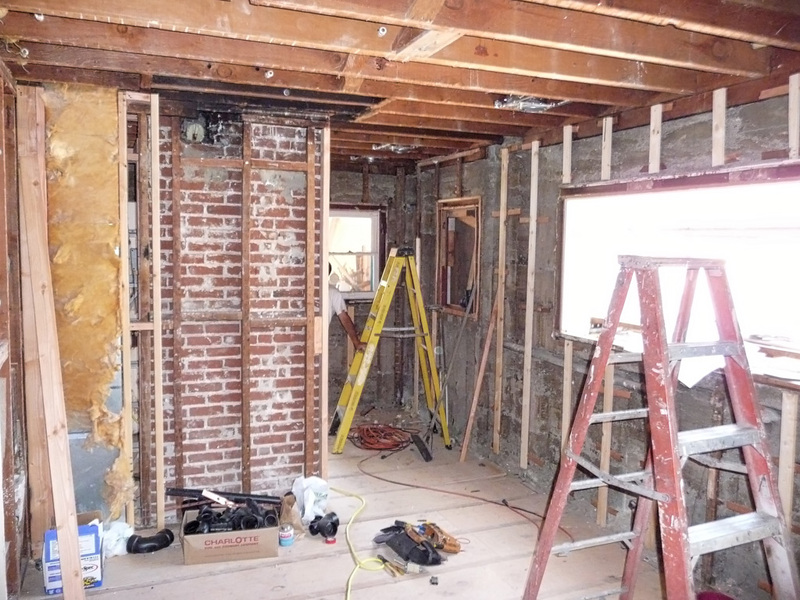 In the middle of the room, behind the refrigerator, is a masonry fireplace base and walls for a second floor fireplace above the kitchen. 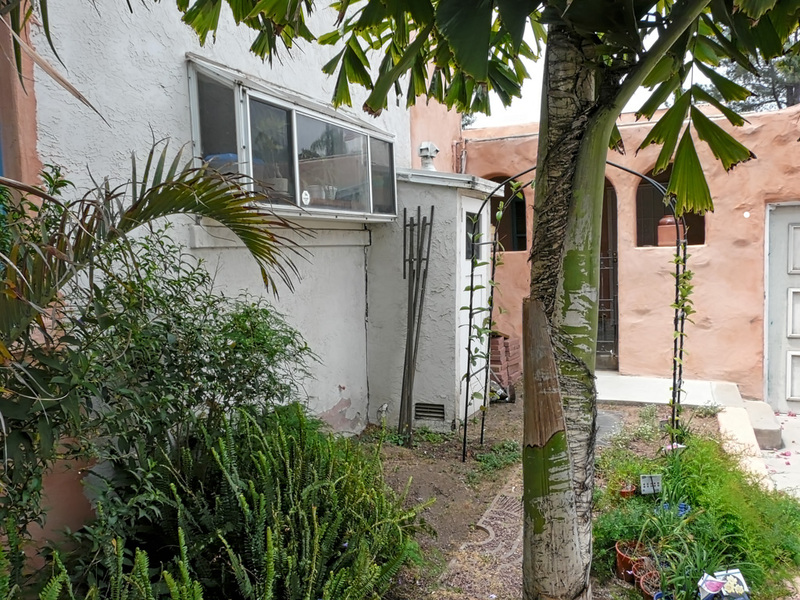 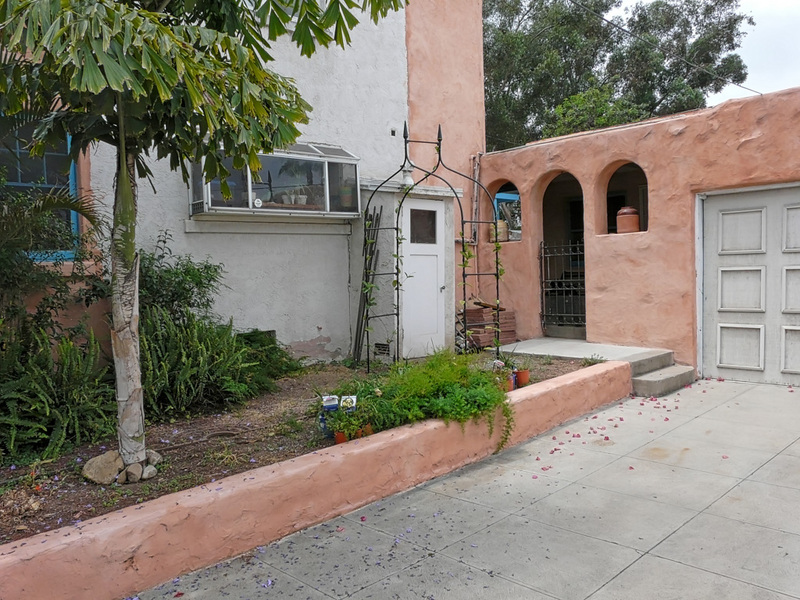 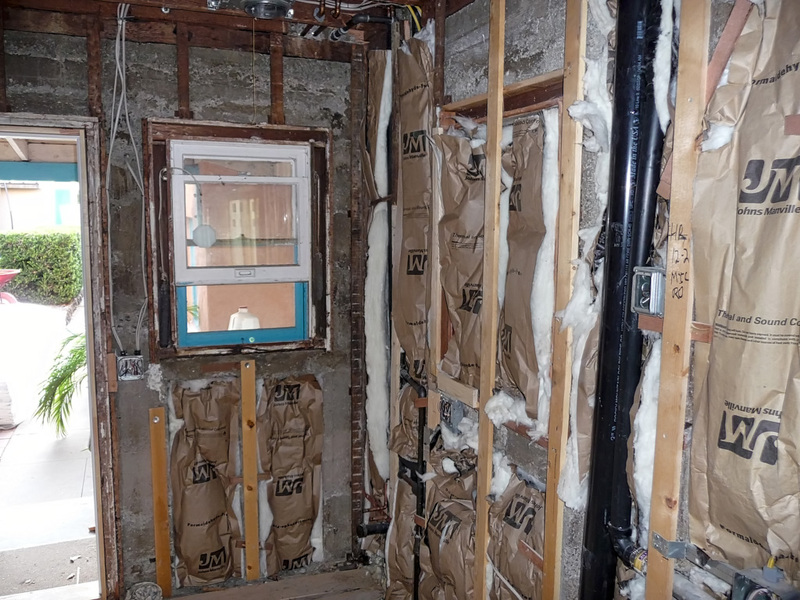 Also, all the exterior walls in this home are made from reinforced concrete, not wood framing, which also limited our ability to move the kitchen sink or change exterior door and window locations. 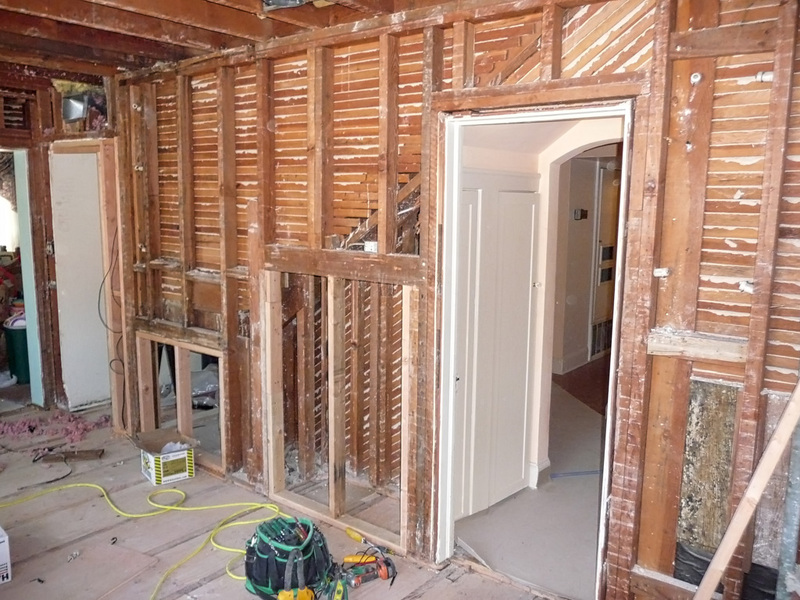 We did add a second door in and original window location by using the existing concrete header. 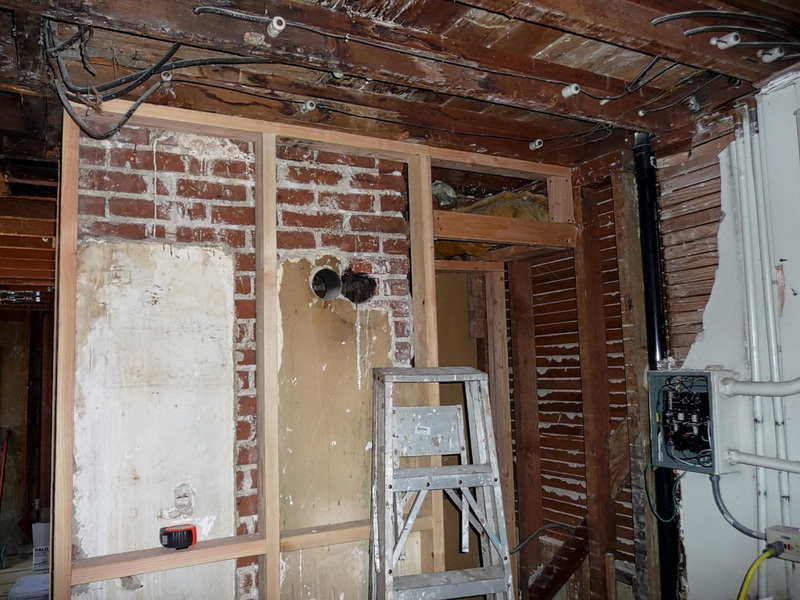 As you can see from the before pictures the existing window over the sink was a large metal garden window which inherently offers little or no ventilation. 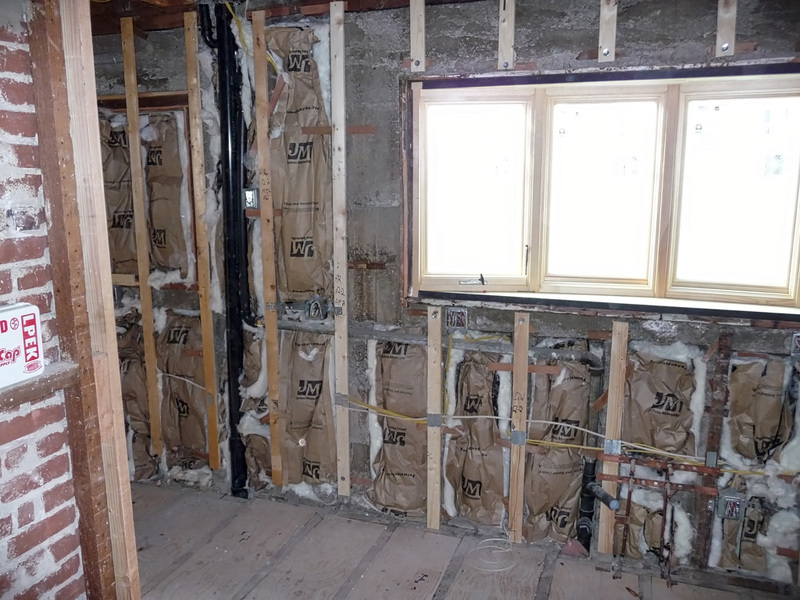 There was also a hot water heater shed right outside that window which was visible from the kitchen. 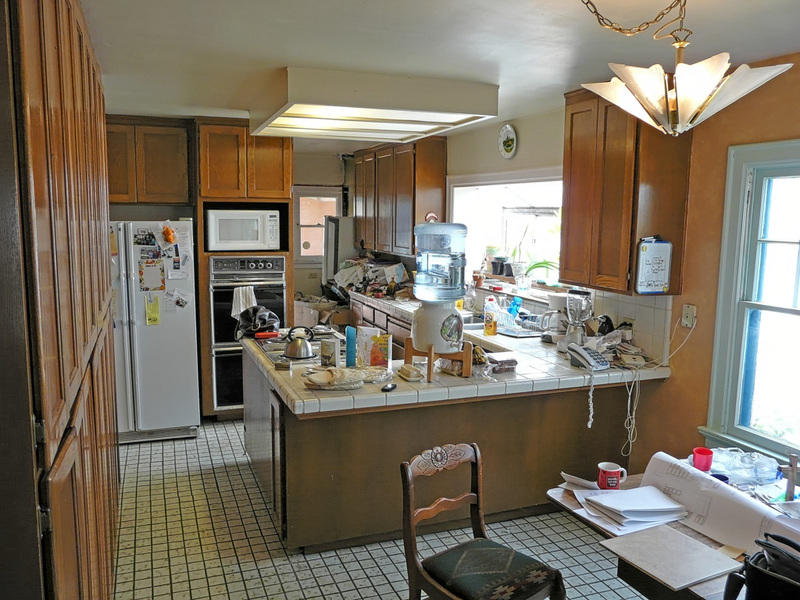 Not real aesthetically pleasing or functional. 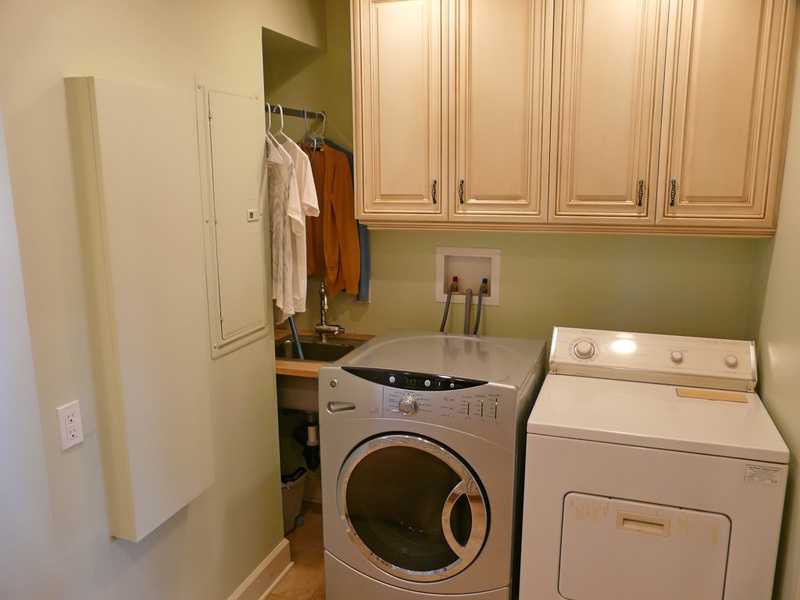 The hot water heater was replaced with a tankless wall mount water heater that looked much better, and will save this client a good deal of money in energy bills. 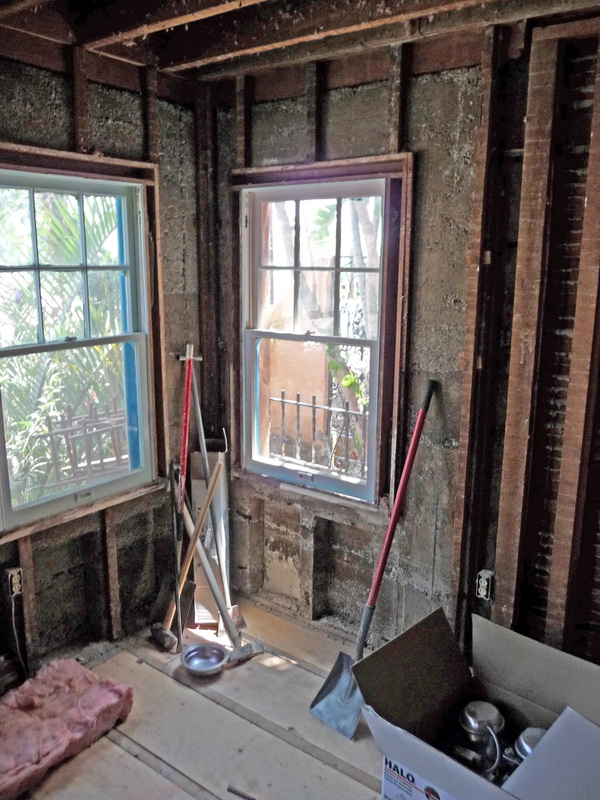 The garden window was replaced with a wood bow window system whose casement windows give complete ventilation and also are more consistent with the architectural style of the other wood windows in this old home. 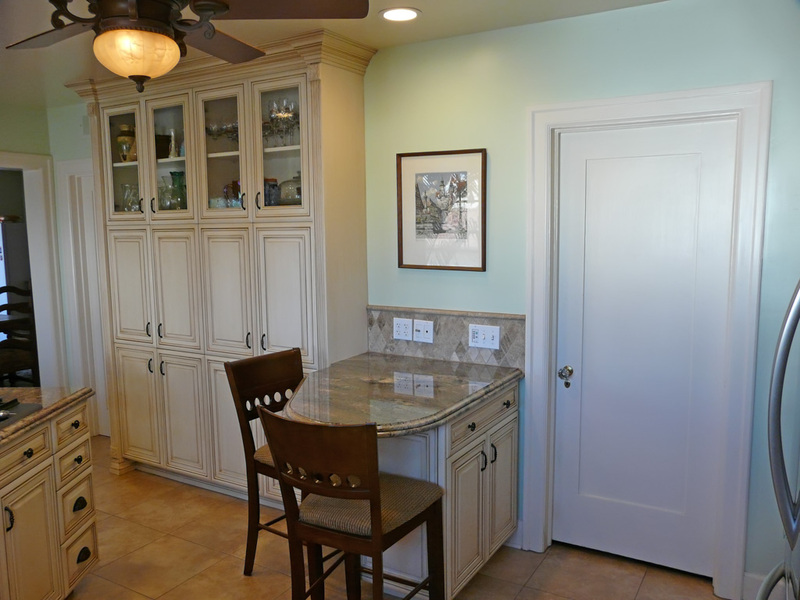 We also added an exterior door and porch in an existing window opening in the concrete wall so the client had a more direct way of getting from the kitchen to the front of the home. 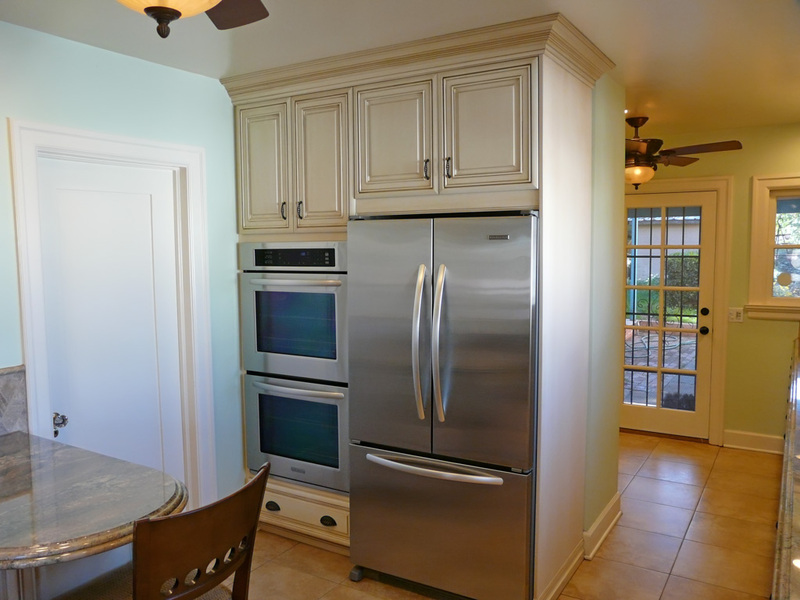 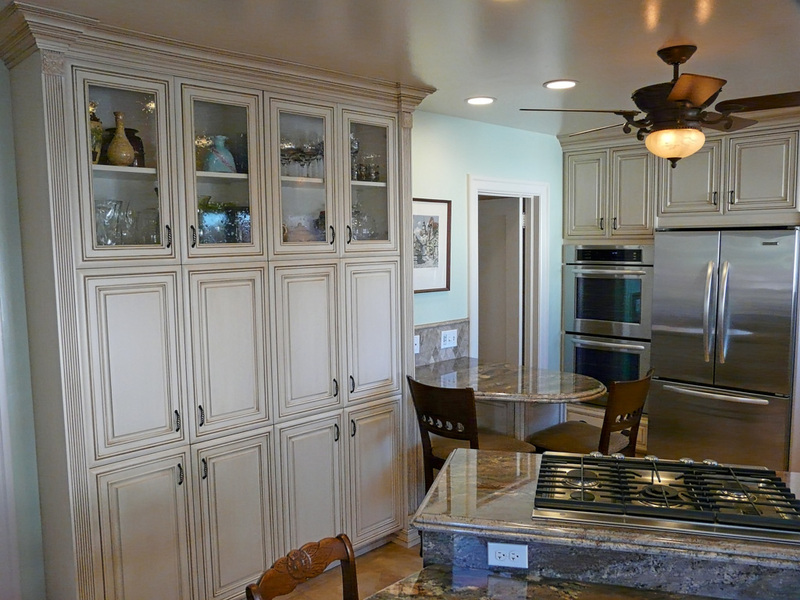 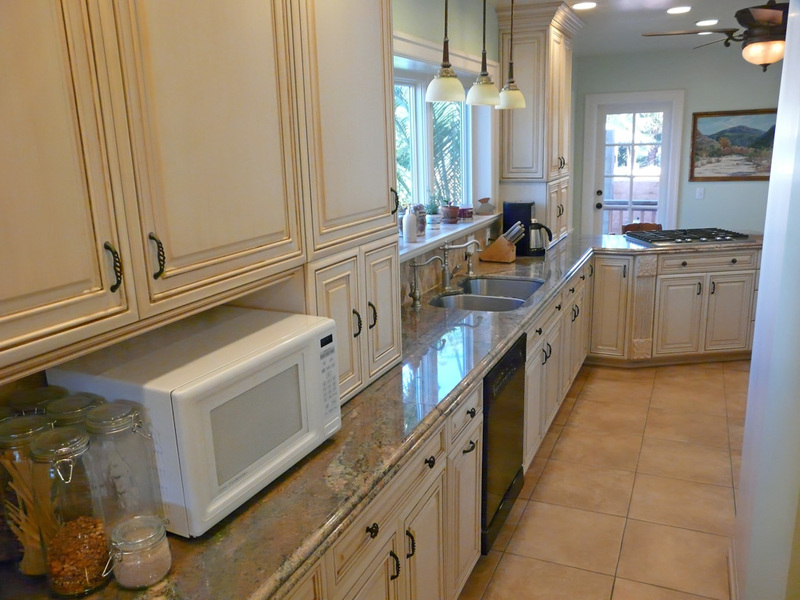 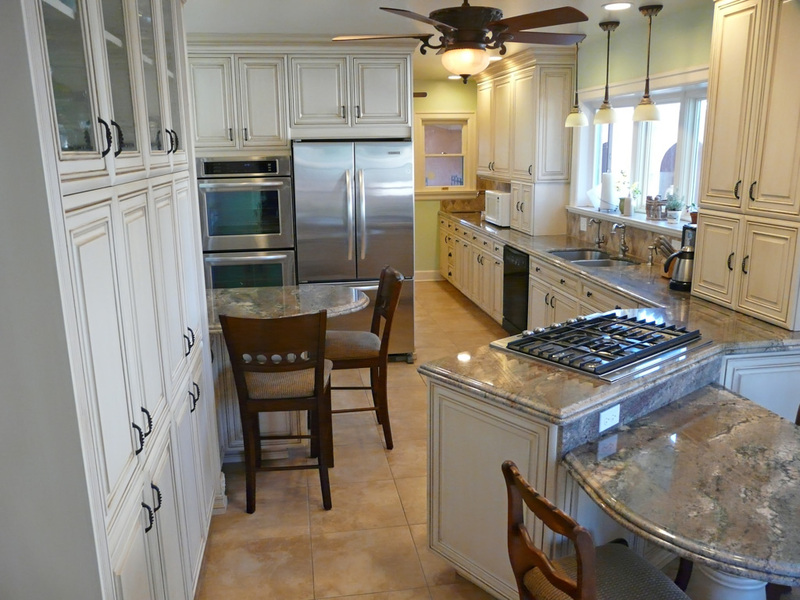 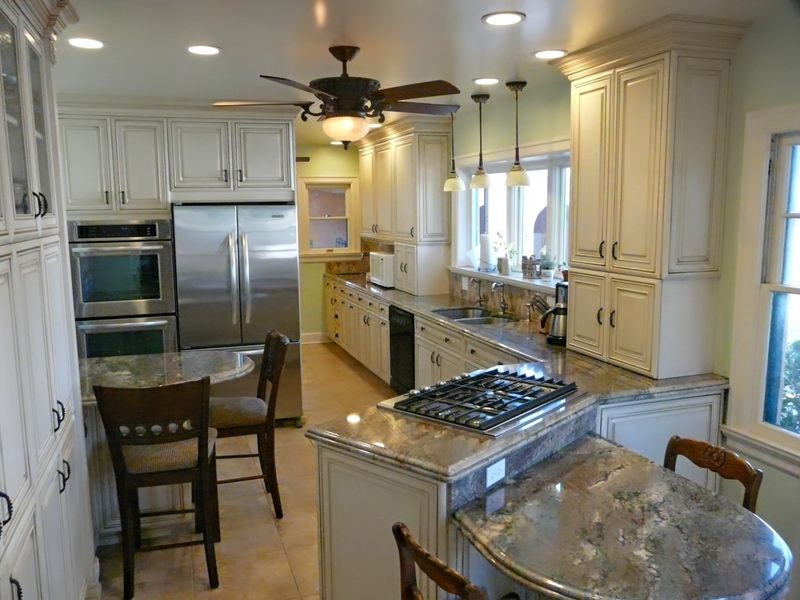 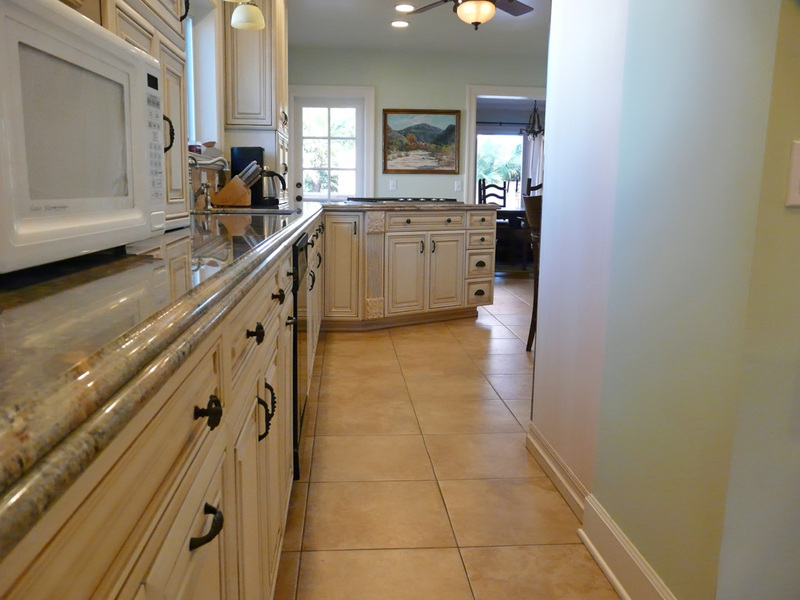 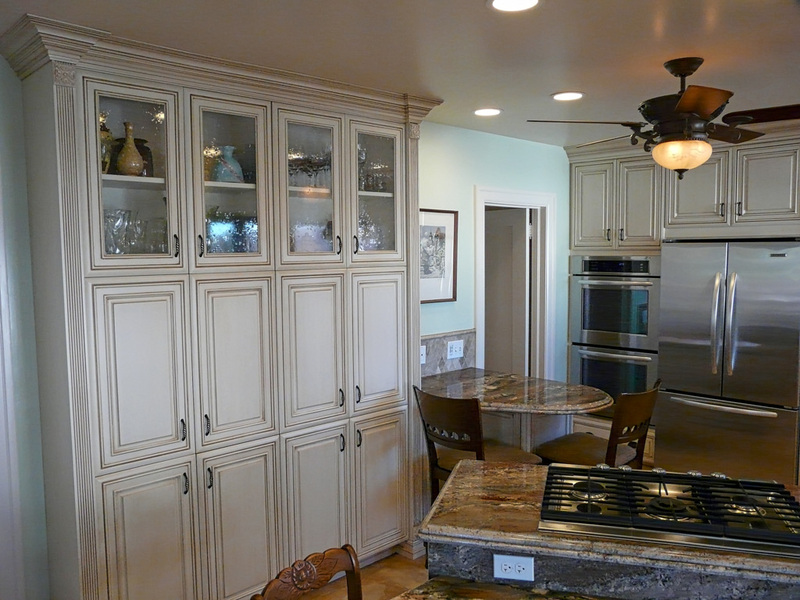 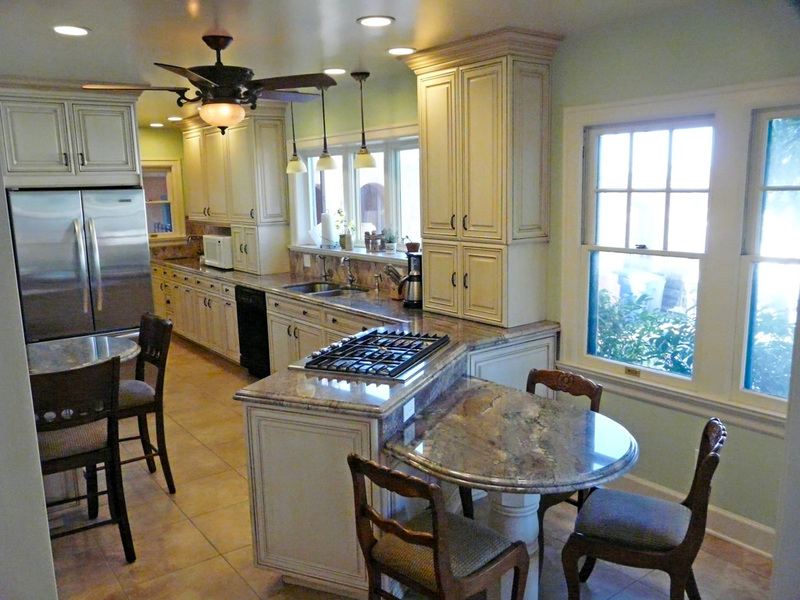 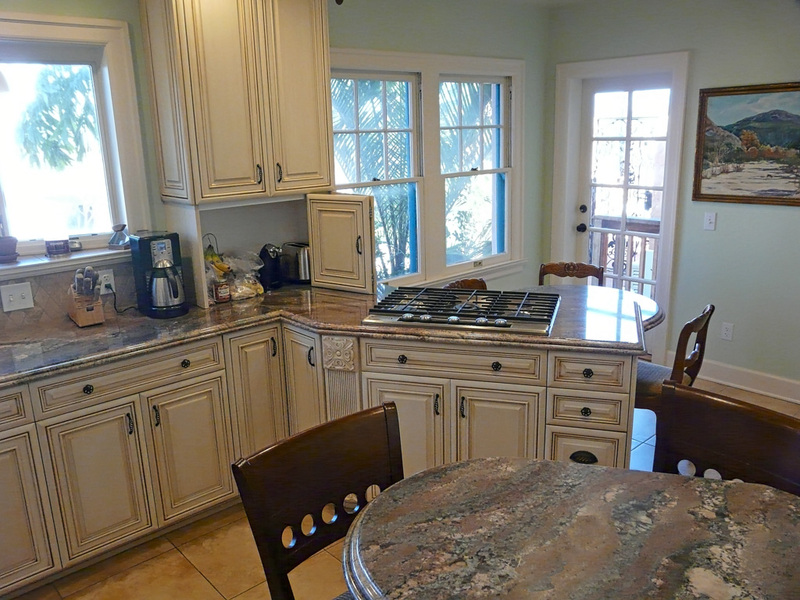 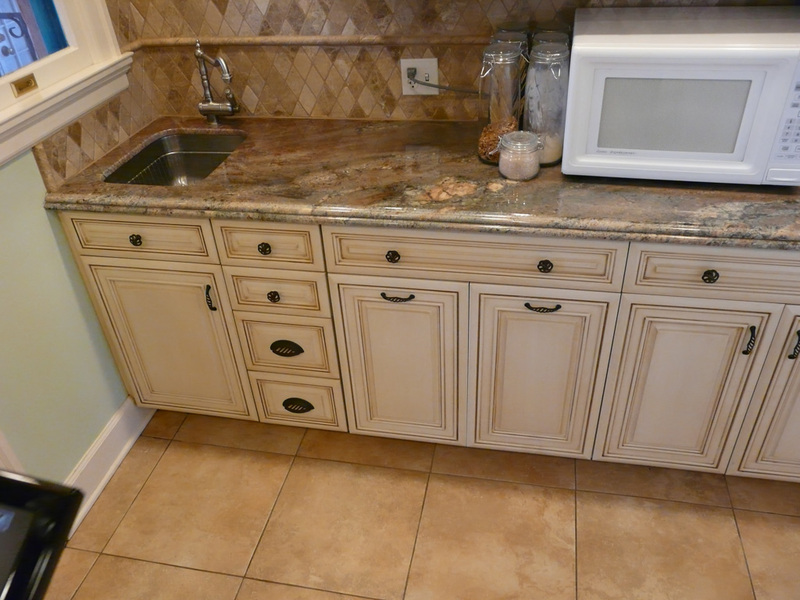 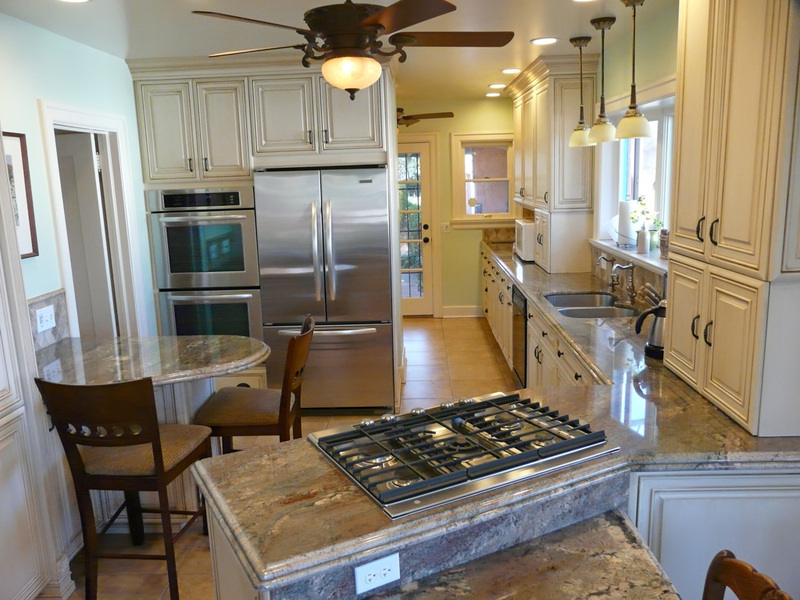 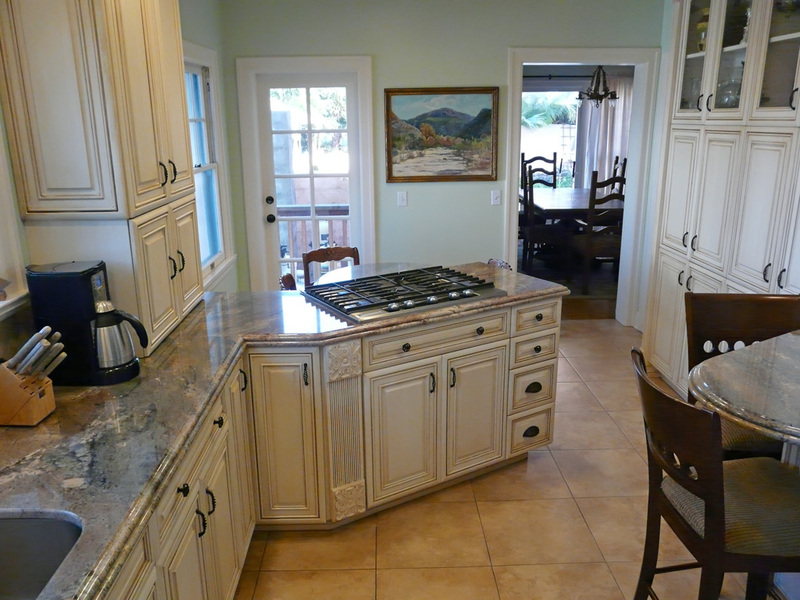 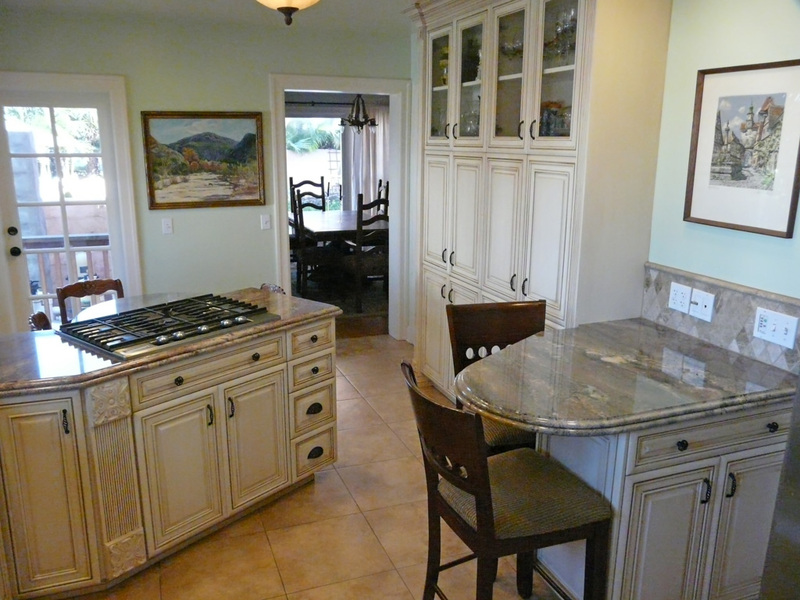 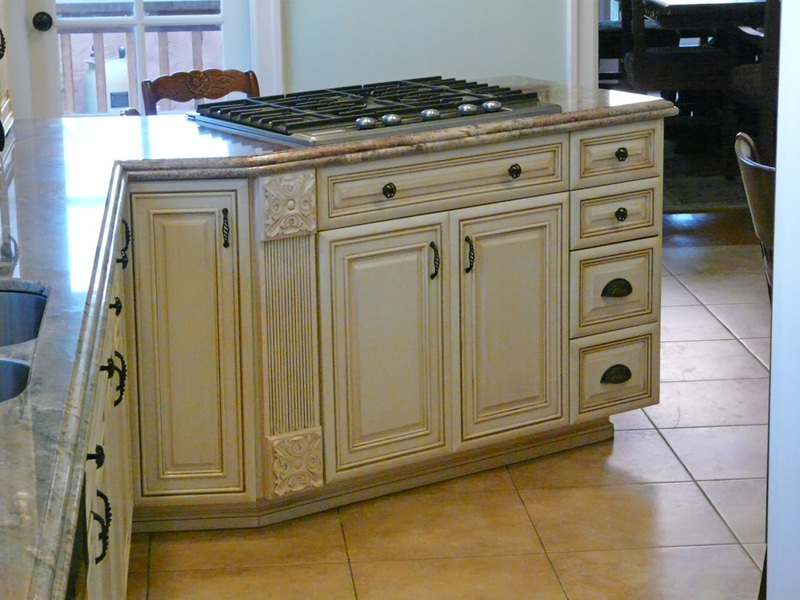 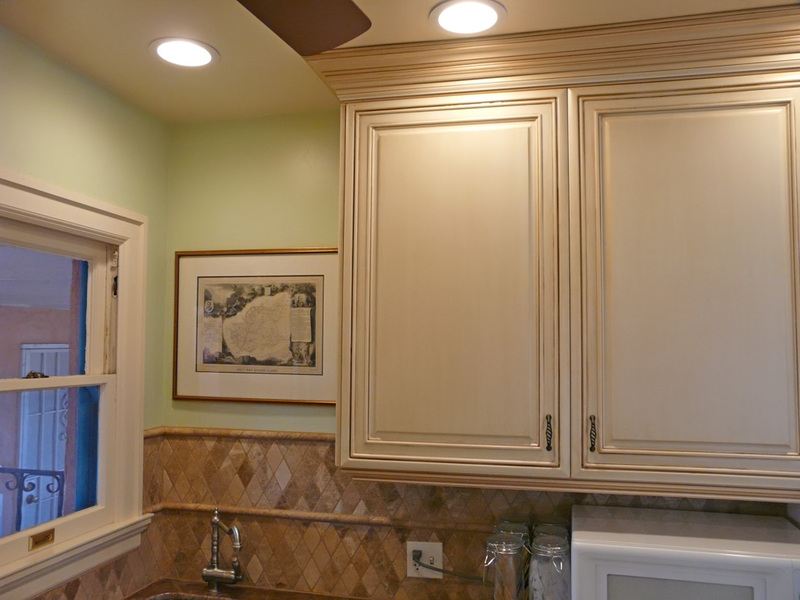 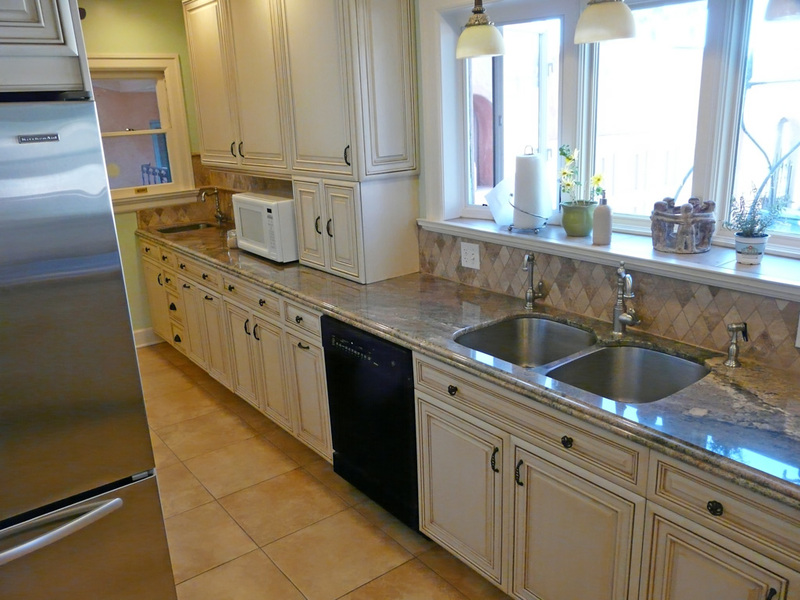 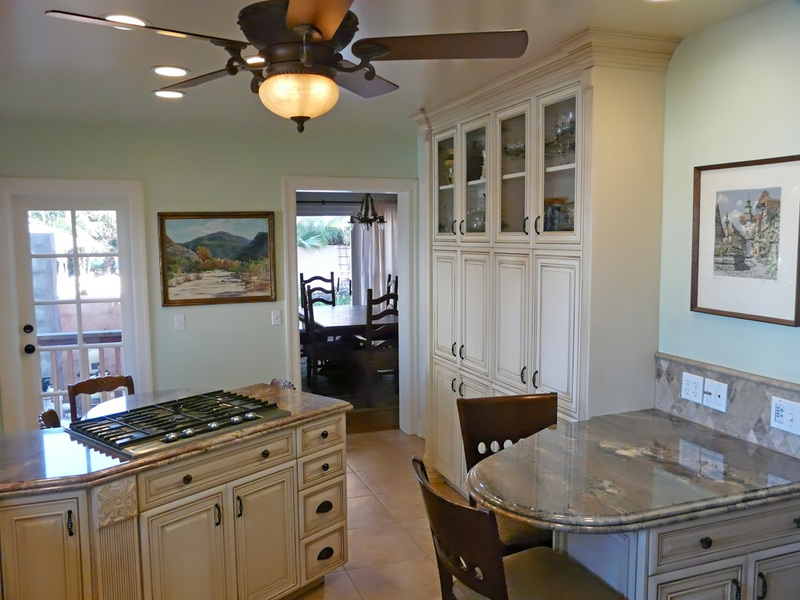 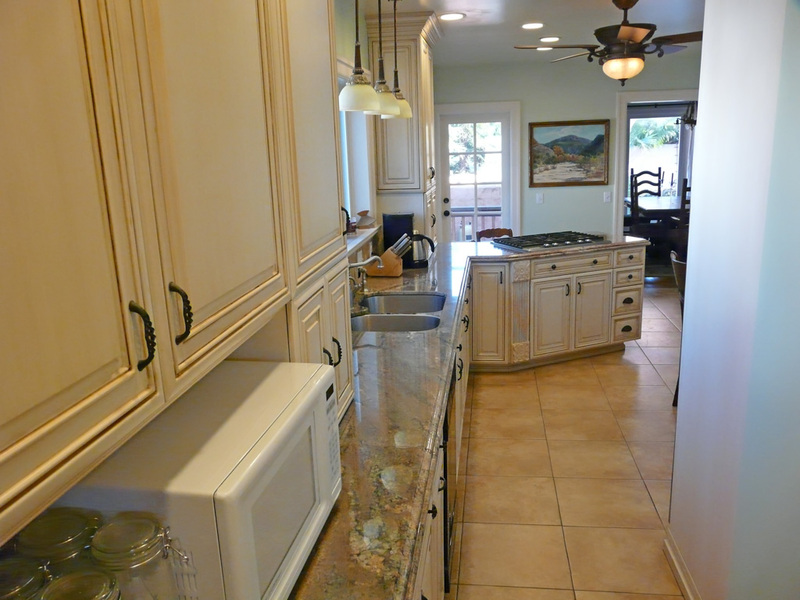 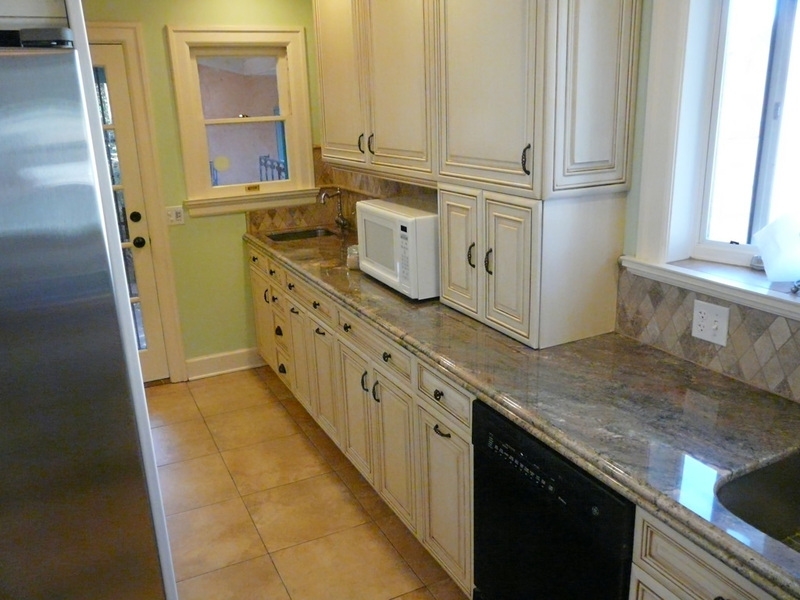 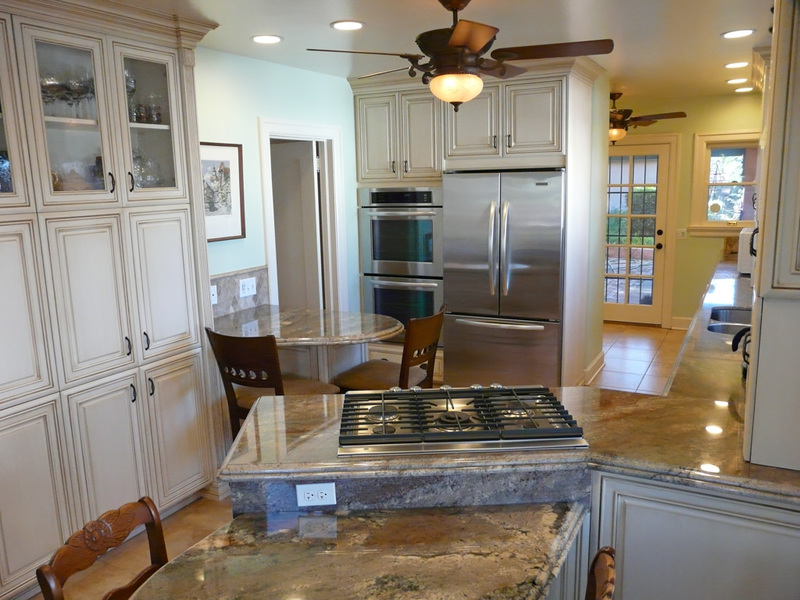 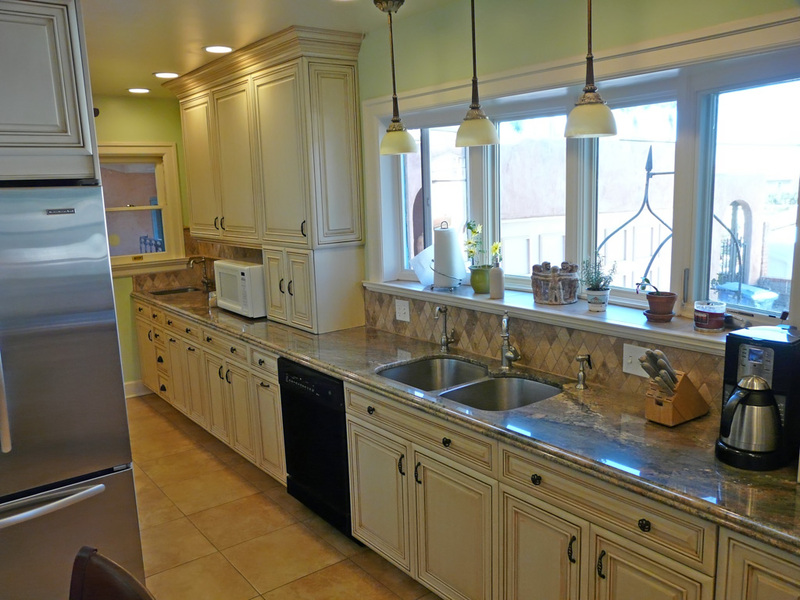 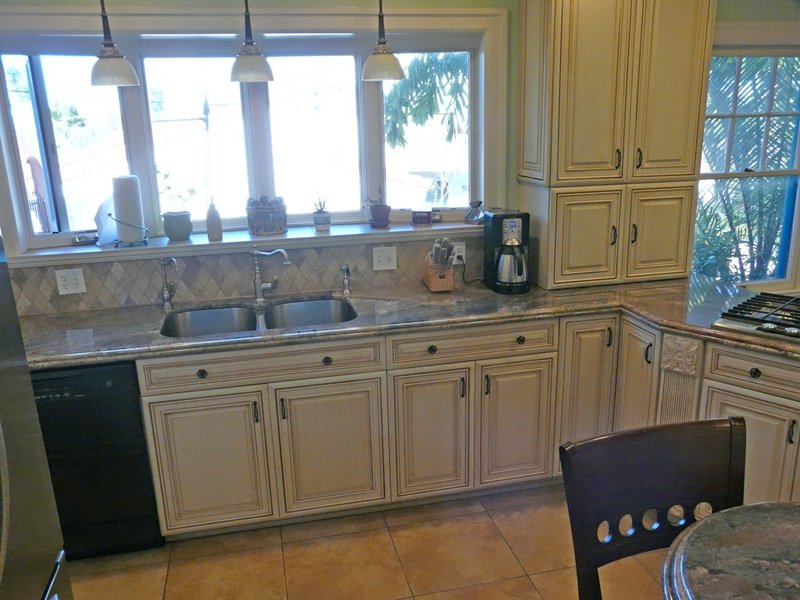 In the kitchen itself, we created a number of features to meet our clients needs. 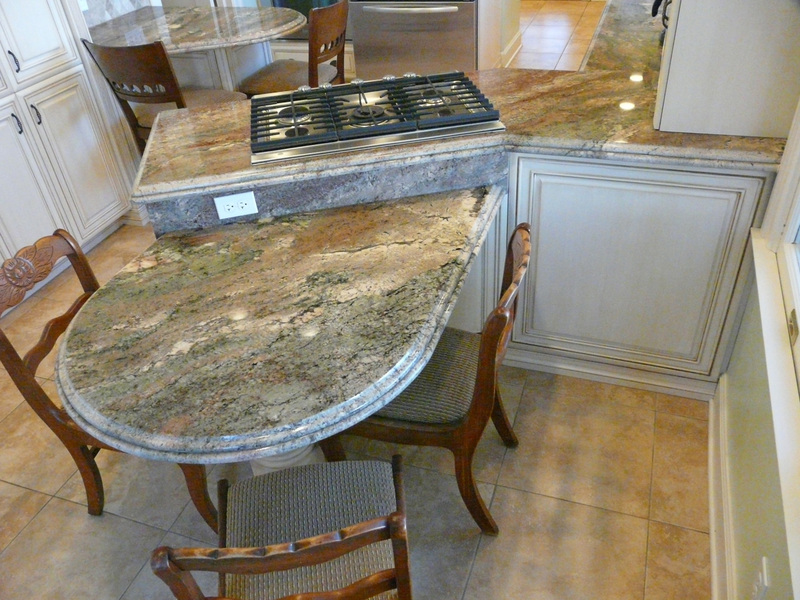 A small granite breakfast table is attached to the back of the cook top peninsula. 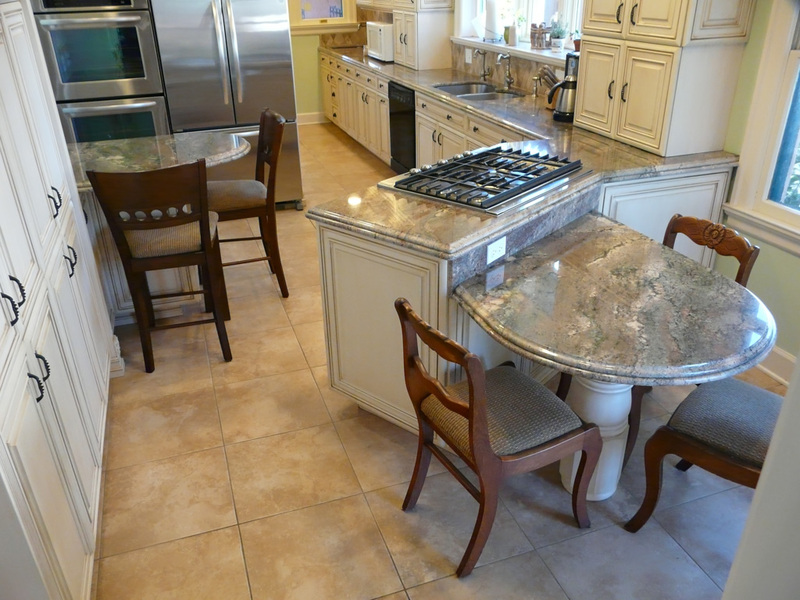 A combination phone center, baking center, eating bar, and food prep counter with sit down stools. 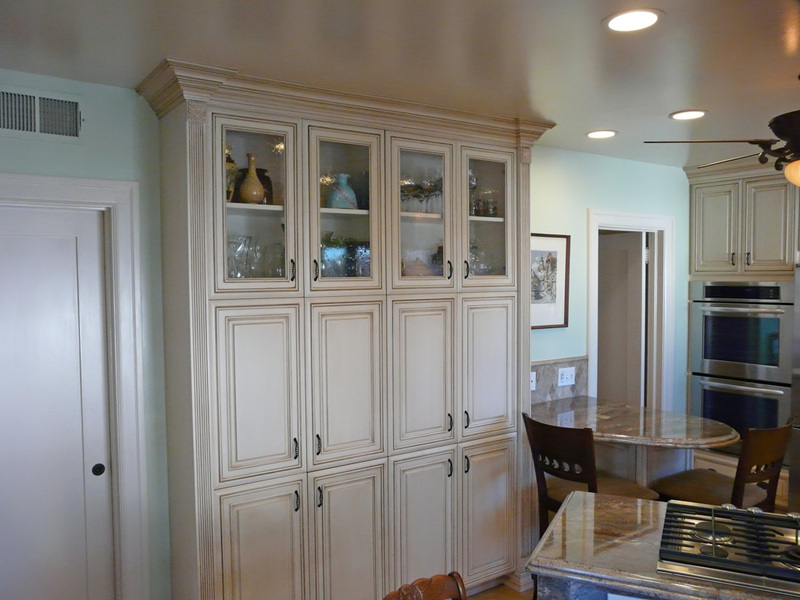 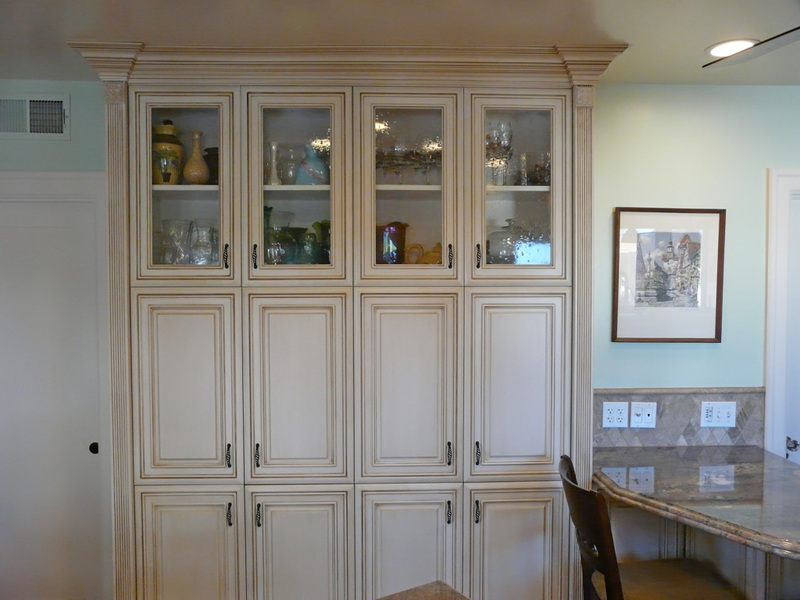 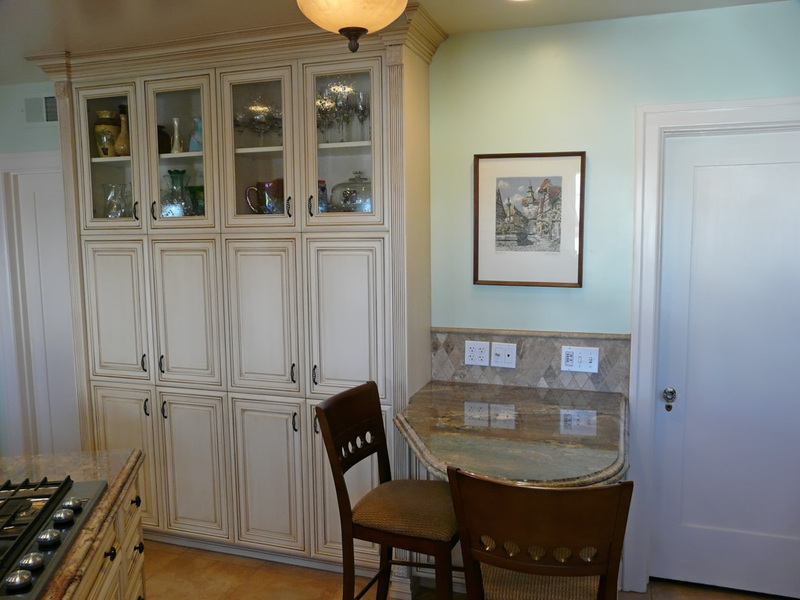 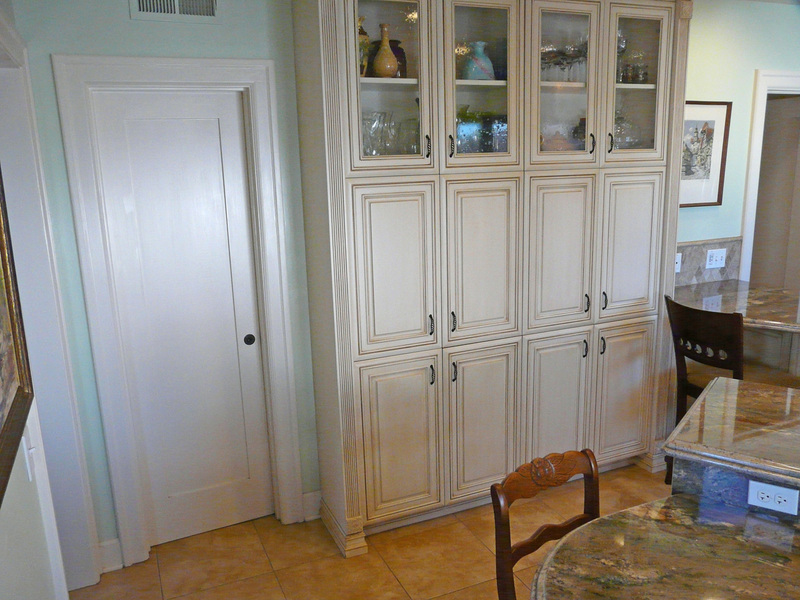 Large shallow pantry cabinet area with decorative glass door cabinets above. 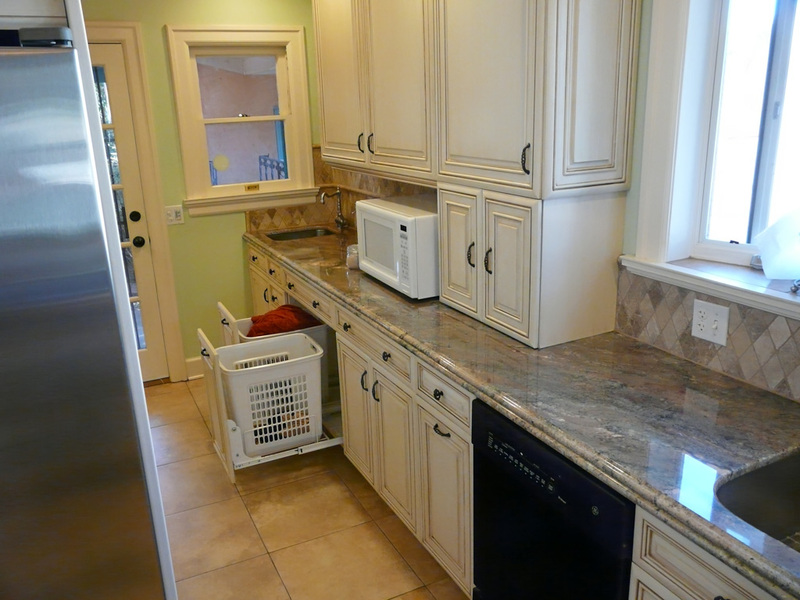 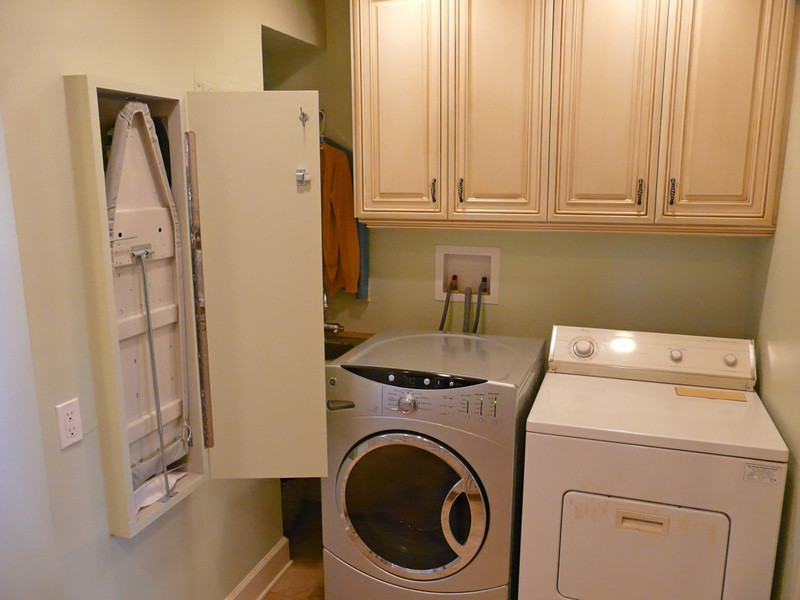 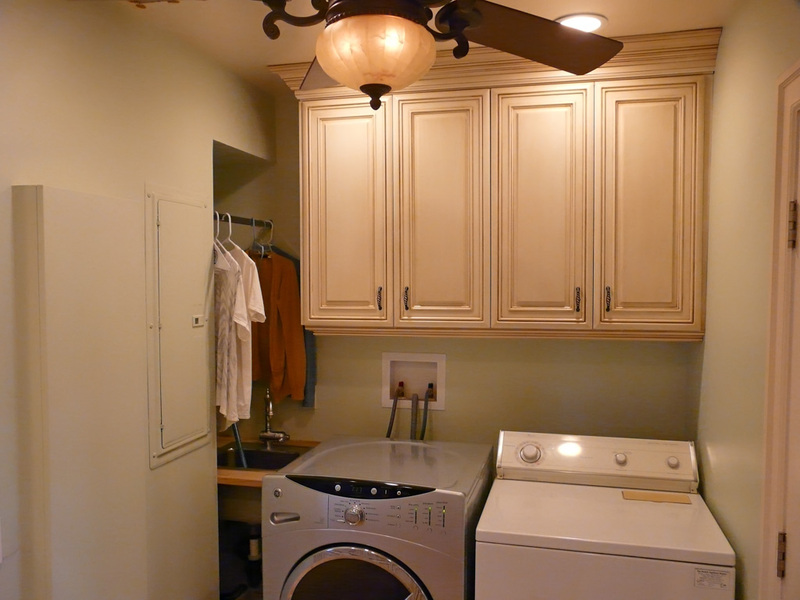 Two appliance garages to store and hide often used counter appliances. 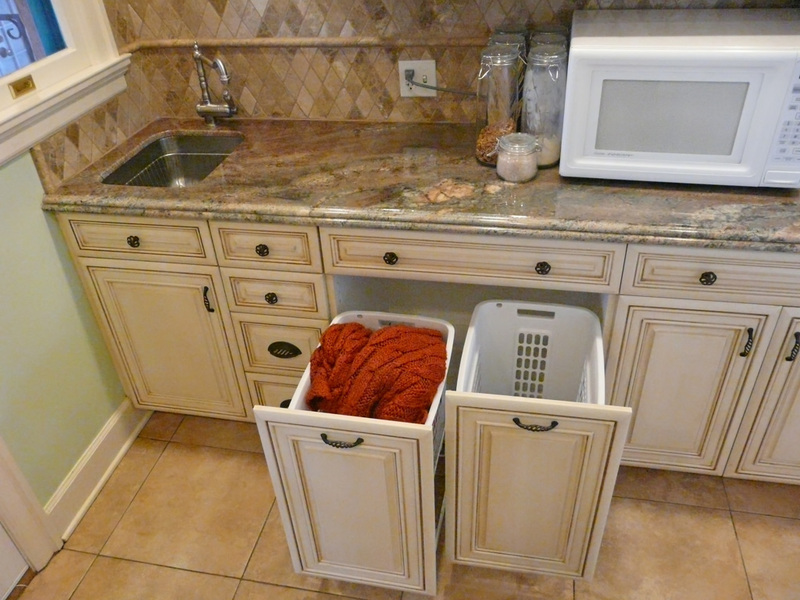 Bar sink at back door for potting plants and use in the laundry. 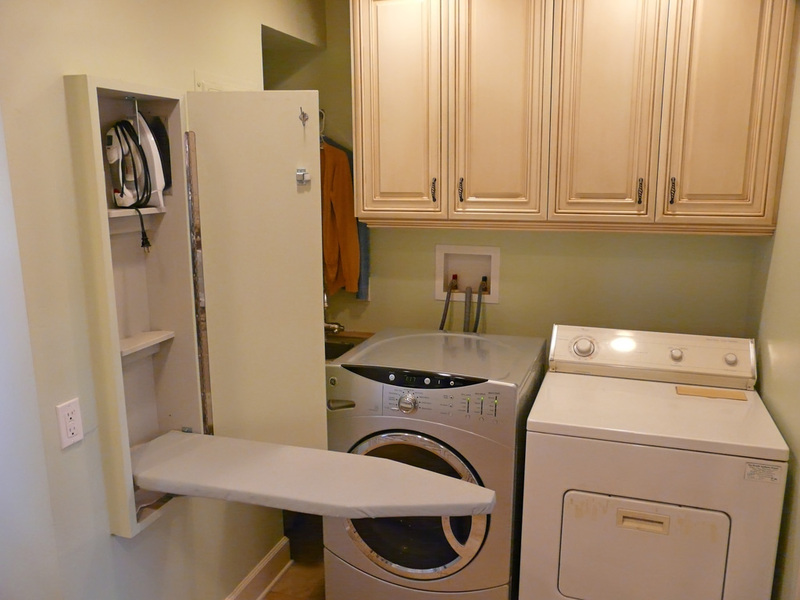 Laundry area hidden behind the oven and refrigerator wall. 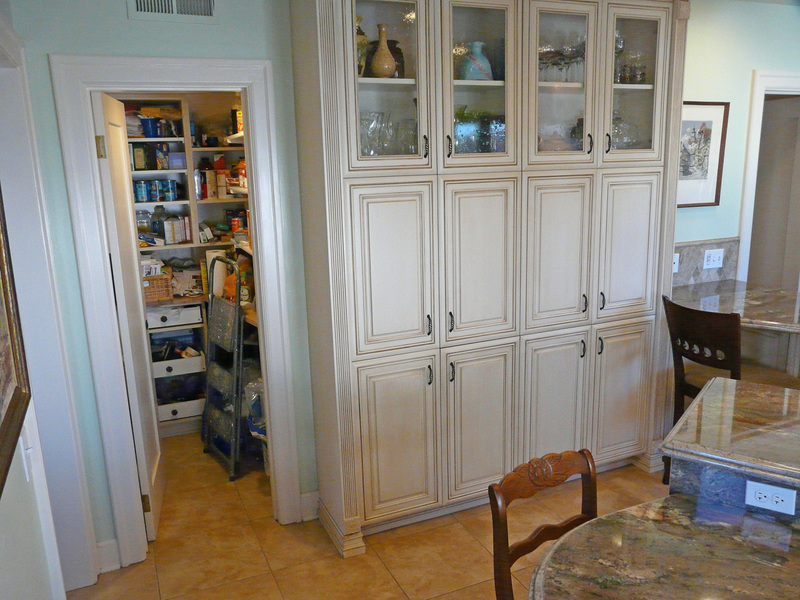 We also added adjustable shelving and some drawers in the existing walk in pantry. 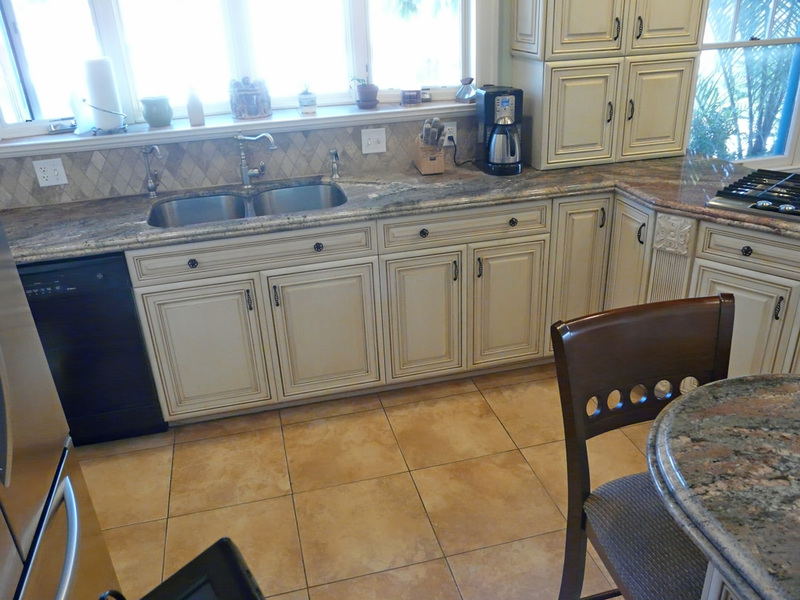 Lots of counter space and storage distributed throughout the kitchen to allow more than one person to comfortably and efficiently work in this kitchen at the same time.